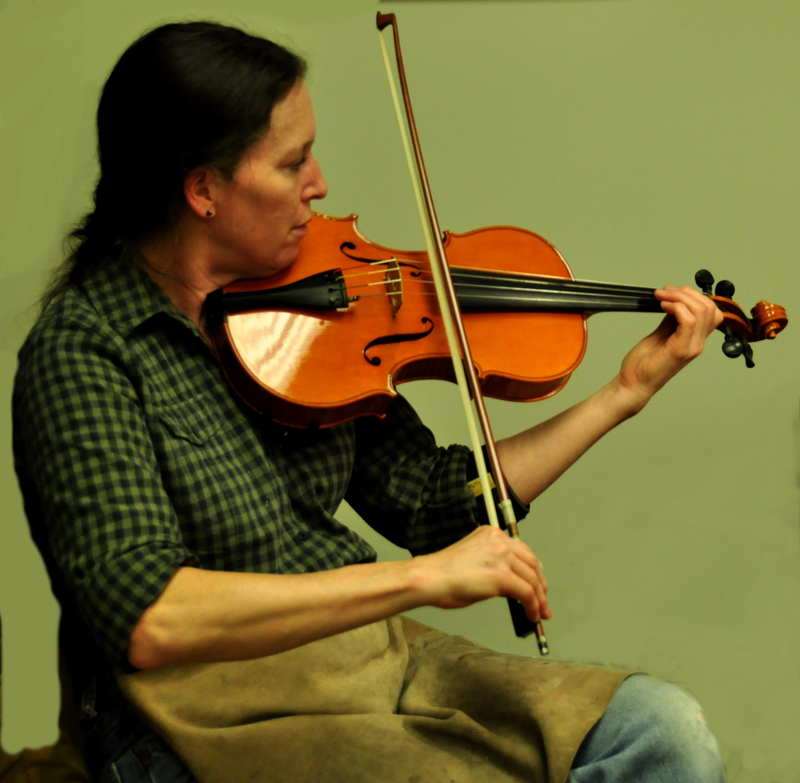 Students of the NSW are being trained as technicians of violin making. Over 90% of the curriculum involves developing hands-on skills and knowledge of construction. Quality is stressed over quantity though the student must try to stay within the stated semester outline schedule. Each step of the construction process will be verbally evaluated by the instructor as to acceptance within certain defined industry standards. In addition, students will have a conference at the end of each semester with the instructor to discuss the semester grades received for the following categories: workmanship, theory, history, and musicianship. All students will report to school and begin work by 8:30 am daily. Students are to remain in the building until dismissal time (3:30 pm). A 30-minute lunch is allowed each day. Smoking is not allowed in the building. Two written warnings will be given prior to expulsion from the school. The expulsion period will be determined by the instructor. A student may be re-admitted contingent on a conference with, and with the approval from the instructor. It is the intention of the New World School that the school be free of alcohol, drugs and other controlled substances, as well as the abuse of other mood-altering chemicals. It is the policy of the NWS that possessing, attempting to possess, using, manufacturing, distributing, dispensing, or in any other manner, transferring, having possession of illegal non-prescription drugs and other controlled substances, real or counterfeit look-alike drugs, drug paraphernalia and alcohol will not be permitted on the premises. Violations of the policy by students will be cause for their immediate removal from school property, and may result in termination from the program. All students are expected to attend class every school day. Regular attendance and punctuality are expected and are important in developing professional work habits. Seven (7) excused absences are allowed per semester. The student must notify the school before 10:00 am if she/he cannot attend class that day. Students entering more than 10 minutes late will be marked tardy, but if entering the school after 9:15 am will be marked absent. Two (2) tardy marks will be recorded as the equivalent of one absence. Absences and tardiness will be noted in the student’s permanent record. Excessive absences and tardiness may be cause for dismissal. The school does not grant a leave of absence. If a student drops out, they will be refunded according to the refund policy. The student may re-register within one (1) year without going through the admissions process. When using any machinery, long hair must be tied back, eye protection must be worn, long sleeves must be rolled to the elbow, and any jewelry on the fingertips or dangling from the body must be removed. Open-type shoes and sandals are strongly discouraged. This is for the student’s protection in case a sharp tool is dropped. A shop apron of strong material should be used to protect the body from sharp tools. Power tools such as grinders, sanding machines, drill presses, and band saws, are not for student use until the student has been trained in their proper use and safety precautions. The student must pass a brief written exam at 100% prior to using the drill press and band saw. This will be completed during the semester the student begins scroll carving. The school carries general liability insurance. The school does not provide health insurance for students. If a student requires treatment or hospitalization for non-liability injury or illness, it is the student’s responsibility to pay for treatment. All instruments made by the student, except the first and final examination in-the-white instrument, are the sole property of the school. At any point in the program, the student has the option to purchase any of her/his completed instruments. Individual instrument prices will determined by the instructor based on overall quality. The price will be fair and reasonable. Even though the school does not have a formal placement service, the instructor maintains many professional relationships. Jobs are usually listed in several trade related journals. It is customary for most graduates to enter the field as repair technicians in established violin shops. Student records such as grades and attendance records will not be sent to prospective employers unless requested by the student. The school will maintain a survey record of graduate employment success/status through various means of correspondence.